Since it's almost Easter we thought it was time to make Easter bunnies at the office using some of the vintage molds from Beth's collection! In order to mold our bunnies we first needed to temper chocolate and thought we'd do a tutorial for all of the home candy makers that want to give it a shot. Tempering gives chocolate that shine you see on store bought candies and a perfect snap when you bite into it. It also results in a higher melting point so the chocolate doesn't melt in your hand. Chocolate that is out of temper has “bloomed” and has white or gray streaks on the surface. This simply means that the cocoa butter has risen to the surface of the chocolate. Bloomed chocolate looks unappealing but has not gone bad, and can be melted down and tempered to get that familiar glossy appearance. Equipment needed: Double boiler or glass/metal bowl fitted on top of a saucepan, spatula or spoon, chocolate thermometer, chocolate mold and/or fruit (or other foods) for dipping. Step one: If you’re planning on molding your chocolate (rather than dipping anything in it) make sure your molds are prepared. Whether you’re using plastic molds or antique metal chocolate molds like Beth’s, always use a paper towel to clean out the cavities and buff/polish them with cotton balls to make sure it’s extra smooth for the next round of chocolate. Never use anything abrasive to clean your molds! Step two: Prepare your chocolate. You’re going to need at least a pound of milk chocolate at hand (not chocolate chips). If your chocolate is in block form, cut it into chunks. 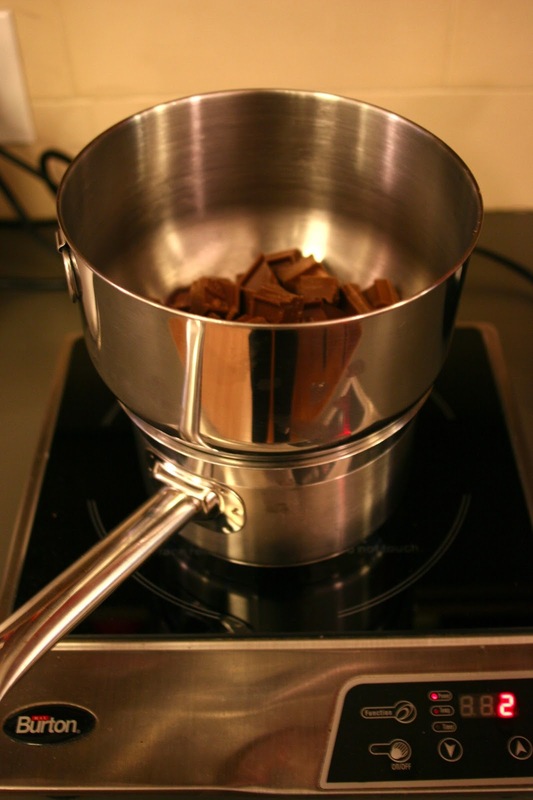 Step three: Place half to two thirds of the chocolate pieces in a double boiler or a glass or metal bowl set over a pot of water on the stove. Allow to melt on low heat while stirring, and check the temperature regularly until the chocolate reaches 110 degrees Fahrenheit. Step four: Remove the bowl of chocolate from the heat (make sure to wipe the bottom so that no water gets in your chocolate!) and add a few chunks of the remaining chocolate and continuously stir to lower the temperature. As the first chunks begin to melt add a few more. Continue this process until the chocolate temperature is below 84 degrees Fahrenheit. At this point remove any remaining chunks of chocolate (these can be wrapped in plastic wrap and allowed to harden so that they can be used later). 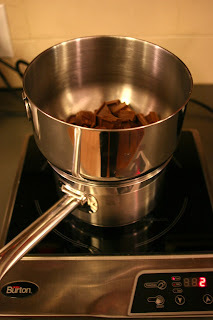 Step five: Place the bowl of chocolate back on the double boiler briefly to bring the temperature back up to 87 degrees Fahrenheit. This will take only a few seconds and you will most likely not have to turn on the heat. At this point your chocolate is tempered and can be used to coat fruit, dip truffles or mold Easter bunnies! Keep the chocolate thermometer in the bowl and place the chocolate back on the double boiler if it dips below 86 degrees when you’re using it (you want to keep the temperature constant so that the chocolate remains in temper). If you are molding chocolates, fill the cavities of your mold, use a spatula to get rid of excess chocolate around the edges, and tap the mold against the table a few times to get rid of air bubbles. Refrigerate your molds until the chocolate has contracted and pops out of the mold easily. Note: These temperatures apply to milk and white chocolate only. Dark chocolate should be taken to 115 degrees, lowered to 84 and reheated to 88-89. An alternative to tempering: Confectionery coatings can be found in grocery and craft stores and are made with vegetable fats instead of cocoa butter so that they melt and set quickly. These coatings are technically not chocolate but often contain cocoa mass and can have great chocolate flavor. Confectionery coatings do not need to be tempered and can simply be melted and molded. Good luck and happy Easter!! !